Viewers at the de Young museum during the Cine+Mas Latino Film Festival. Photo by Erik Verduzco. 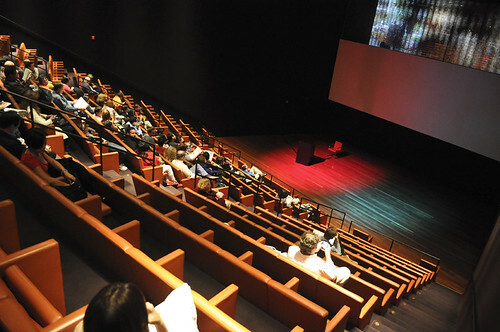 As the light from a massive screen shined over the 200 person audience, it became apparent that the coming week would be full of education, culture and art at Cine+Mas’s Latino Film Festival at the de Young Museum. Popular with members of the film and Latino communities, the festival serves as a window to different cultural perspectives and visual art through documentaries, short film and narratives. “My hope is that audiences will recognize that cinema can be entertaining and also provide a powerful medium through which to create dialogue on pressing social issues,” Martinez continued. The festival is presented by Cine+Mas, an organization founded in 2009 after the collapse of another independent film organization. The non-profit film collective has soared and grown over its short three year stint. “Cine+Mas comes from my own love of cinema and we will keep going until we can’t anymore,” said Lucho Ramirez, founder and director of Cine+Mas. The festival highlights works from countries across Latin America and Spain as well as Bay Area filmmakers to give a complete cultural perspective of Latino life. Gladys Rocha, member of Cine+Mas’s organizing committee, believes in the importance of preserving culture. The films featured in the festival were strategically chosen to make the audience think about outside stereotypes and see the differences in culture. The film festival closes Sunday with a salsa party at the El Rio beginning at 4 p.m. Tickets are $8.